President Russell M. Nelson has said, “I testify that the earth and all life upon it are of divine origin. The Creation did not happen by chance. It did not come ex nihilo (out of nothing)….It is God who made us and not we ourselves. We are His people! The Creation itself testifies of a Creator. We cannot disregard the divine in the Creation. Without our grateful awareness of God’s hand in the Creation, we would be just as oblivious to our provider as are goldfish swimming in a bowl. With deep gratitude, we echo the words of the Psalmist, who said, ‘O Lord, how manifold are thy works! in wisdom hast thou made them all: the earth is full of thy riches.’” April 2000. Male box turtle in Merikay's garden, July 2018. The reddish orange eye is a male indicator. Eastern box turtle were once very commonly found throughout our region. In 2013 I heard Dr. Tallamy, an entomologist, speak and it changed the way I garden. He told us that near the University of Delaware is a 40 acre woodlot which has been left undeveloped and undisturbed. In 1968 a biologist surveyed the woodlot and found 91 eastern box turtles. Using the same technique, subsequent counts have followed the population with 22 turtles in 2002 and only 12 in 2012. Dr. Tallamy predicted that there will be none left at the next counting. If that is the fate in a contiguous 40 "natural" acres, it is possible to project decreased numbers in areas with habitat fragmentation, roads, lawns, and development. Female turtles need areas in which to lay eggs -- turf grass areas will not do. After hearing a talk by Dr. Tallamy I replaced large areas of our lawn with native trees, shrubs and perennials. Within a few years I found turtles nesting in my garden! I don't see the turtles often, but occasionally as I'm in the garden I will see one slipping back under plant cover. I sometimes see them at my garden pond. Sadly, as is too often happens to these turtles, I found one crushed by a vehicle on the road near our house. 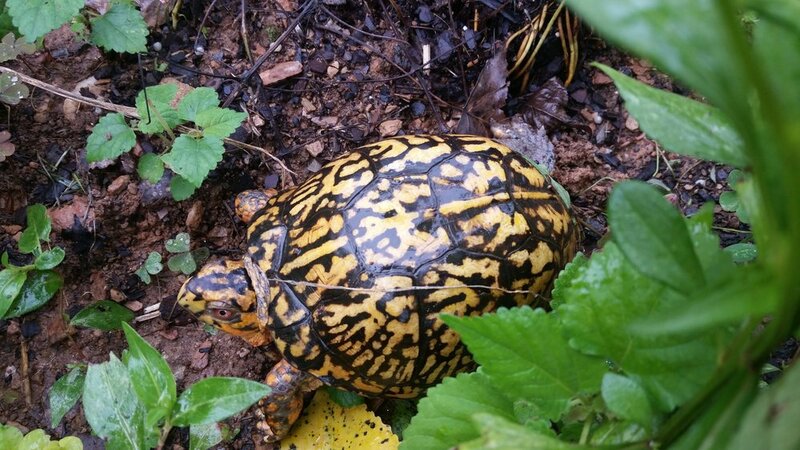 I don't know what the fate will be for the eastern box turtle, but this is one example of how our landscaping choices can make a difference. With so much working against their survival, it seems the least we can do is replace lawns with habitat that offers the possibility of creating new generations. Real Eastern box turtle at Merikay's garden pond near plastic alligator friend. You may need to educate and work with your neighbors to create contiguous habitat areas. I've since learned that it requires about 10 box turtles to an acre to have a self-sustaining population. These box turtles are slow to mature and have relatively few surviving offspring though if they live in healthy habitat they commonly survive to 50+ years. Each spring in May and June millions of Atlantic horseshoe crabs mate and lay eggs on the shores of the Delaware Bay. If you've walked along the beaches of the mid-Atlantic, chances are you've seen the ancient crabs in their remarkable armor but have you ever seen this annual ritual? The invasion is most dramatic when there is a full moon or new moon, creating the highest tides of the month. When it’s over, the beach is littered with the helmet-shaped shells and trillions of its greenish eggs. While these animals spawn from Maine to the Yucatan Peninsula, Delaware Bay is the center of activity. Warm water and sandy shores without big surf are part of the reason. Some swim and crawl more than 60 miles — from the continental shelf off the mouth of the bay — to get there. Horseshoe crabs are related to trilobites, which lived 550 million years ago, and have existed as a distinct species for at least 450 million years. Female horseshoe crabs are slightly larger than males. The underside appendages also vary between the males and females. Atlantic sturgeon can grow to 14 feet long and weigh 800 pounds. These ancient fish have been nearly exterminated -- only about 200 are known to survive in the Chesapeake Bay region. Thanks to efforts by researchers and others, there is some hope of rebuilding their populations though recent cuts at the EPA may jeopardize years of progress. I'm posting this in November and you might consider sharing with your family the history below as we remember the early colonists at Thanksgiving. More than two thirds of the 214 settlers at Jamestown died in the harsh winter of 1609, during what they called the “starving time." In the spring, the survivors saw something miraculous surging up the river: an armada of dinosaur fish, massive as logs, with bony armor, forked tails, sloped heads, and dangling whiskers. They were Atlantic sturgeon, returning up the James River to spawn. They could wade into the river and spear huge fish with their swords, thus saving their colony from starvation. Sturgeon are sometimes described as the “foundation fish," because they allowed the English to keep their tentative toehold in the New World. Now we have taken them to the brink of extinction. If you want to learn what we, as earth stewards, can do to help save the sturgeons, please contact Merikay at merikays@verizon.net. The photos below of a northern cricket frog shows the distinct yet variable markings. The northern cricket frog is one of 14 species of frog and toads found in Montgomery County. Learn more including how you can become a citizen scientist to study frogs in a spot near you as part of FrogWatch. Photo on the left is from Montgomery County, the one on the right was photographed in Tennessee (www.leaps.ms). Virginia has a great website on frogs and toads as well as salamanders, lizards, snakes and turtles: Since this post started with a very small frog, here are some other similarly small frogs which might help you to ID your next tiny frog. 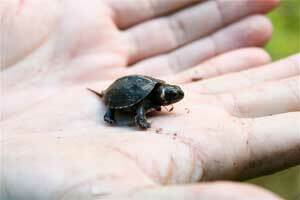 At only about 4 inches long, the bog turtle (Glyptemys muhlenbergii) is North America's smallest turtle. It's also listed as a federally threatened species. Though rare it can be found in the Chesapeake Bay region. This species typically shows a bright yellow, orange or red blotch on each side of the head. The nearly parallel sides of the upper shell—known as its carapace—give bog turtles an oblong appearance when viewed from above. These small, semi-aquatic turtles consume a varied diet of primarily insects, snails and worms. Bog turtles usually occur in small, discrete populations, generally occupying open-canopy, unpolluted, herbaceous sedge meadows and fens bordered by wooded areas. Bog turtles depend upon this diversity of habitats for foraging, nesting, basking and hibernating. The northern population of bog turtles ranges from New York and western Massachusetts south to Maryland. The greatest threats to the bog turtle are the loss, degradation and fragmentation of its habitat. The species is also threatened by poaching for illegal wildlife trade. Biologists are using goats to maintain wetlands through managed grazing. For a few months in 2008, 19 goats were placed on a 5-acre bog turtle site in Carroll County to control unwanted vegetation, including the invasive multiflora rose. Installing fences on 6 acres at two sites in Maryland and a 3-acre site in Delaware to protect these sites from overgrazing. Working with a Maryland landowner and USDA-NRCS to protect 30 acres of bog turtle habitat through the Wetland Restoration Program. Prioritizing 65 bog turtle sites in Maryland for future restoration efforts based on population size, reproduction and connectivity to other bog turtle sites. Is there anyone interested in researching what we at Earth Stewardship East can do for the bog turtle? If so, contact Merikay at merikays@verizon.net. 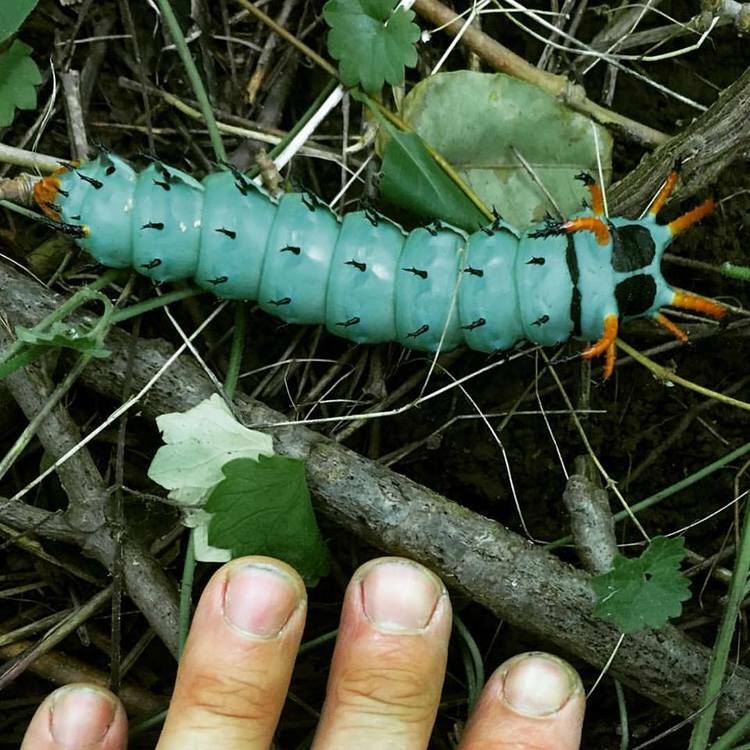 Earth steward Taylor Knight photographed this hickory horned devil on Van Deventer Island in the Potomac. This gorgeous caterpillar can be found throughout our region, generally as it drops to the ground looking for a place to pupate. It is one of the largest native caterpillars -- can get as big as a hot dog! Not surprisingly, it becomes a very large moth -- the regal moth with up to a 6 inch wing span. Native trees are its food source: walnut, hickory, persimmon and others. Common through out the United States and up into Southern Canada, these brilliant dragonflies can be spotted by ponds, lakes, marshes, and bogs. Larvae are very tolerant of wetlands with poor water quality and low dissolved-oxygen levels. Males are a brilliant blue as pictured. Females are more yellow brown. I was able to watch a female visit the pond and lay eggs on the lily pads. Photo below by Terri Pitts, local Master Gardener. I love watching the native bees in my garden.Take this challenge, find 5 different species of native bees in your garden or neighborhood. If you want, send us a photo. There are 4,000 species of native North American bees from tiny Perdita to large carpenter bees: all pollinator flowers, especially native flowers. The European honey bee, remarkable as it is, doesn’t know how to pollinate a tomato, pumpkins, watermelons, blueberries or an eggplant flower, while some native bees are masters at this. Native bees come in a wide range of sizes,shapes, life styles, places they frequent, nests they build, flowers they visit and season of activity. For instance, the Southeastern blueberry bee is capable of visiting as many as 50,000 blueberry flowers in her short life. Bees are descended from wasps. Most wasps are carnivores. Millions of years ago, when the first flowering plants began to bloom, some wasps made a switch from hunting prey to gathering pollen for their brood. Gathering pollen and nectar requires certain adaptations different from those of hunters; so they started to change to meet these requirements and consequently became bees. Many of our native bees are ground nesters. They choose a bare spot, with sunshine and start digging. They build a long tunnel slightly wider than their own bodies. Some don’t want any neighbors around; others prefer the company of their own sisters. They are solitary in the sense that each digs her own nest and takes care of her own brood all by herself. Others show different levels of cooperation, sharing the tasks of nest building and food provisioning. At the end of the tunnel the mother bee builds a chamber a little wider; this will be the nursery for just one bee. She fills it up with enough food for one bee to grow from egg to full size. There she lays an egg and seals the chamber. She will add other branches to the tunnel; at the end of each there will be another cell or chamber properly stocked and with an egg. Some bees take advantage of already existing holes -- hollow stems or holes made by beetles or others in trees. There, they construct chambers, usually lined up in a row, which they stock one by one to serve as nurseries. Native mason bees are hole nesters who use clay to build walls between cells and to seal the entrance. Leafcutters cut round pieces of leaves for the same purpose and also to line the inner walls of the tube. An excellent book on our native bees recommended by the Xerces Society ( xerces.org ) is The Bees in Your Backyard: A Guide To North America's Bees by Joseph S. Wilson and Olivia Messinger Carril (Princeton, 2015). Below are some native bees on native sunflower, coneflower, and monarda punctata.